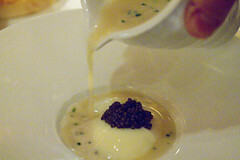 So, the eve of New Year’s Eve, we went to Le Bernardin 155 West 51st Street, New York, NY 10019, a much anticipated dinner, a holiday treat to ourselves. No presents this year since we’re getting a new apartment (more on that soon) but time with our friends, Sara, Sheng, and Elaine, is gift enough. The space was louder than expected; nice looking, but not special; and didn’t really give me the first impression I expected. 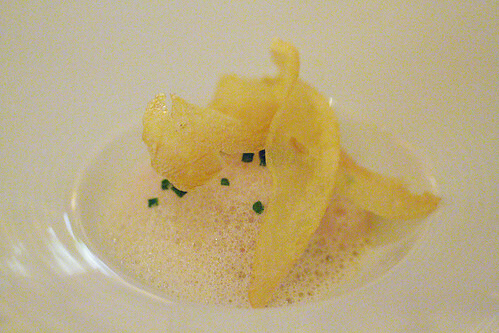 Instead of an amuse, a whole dish of sweet shrimp in mushroom broth, topped with potato crisps arrived. Counting about five pieces, it was a generous gift from the chef. 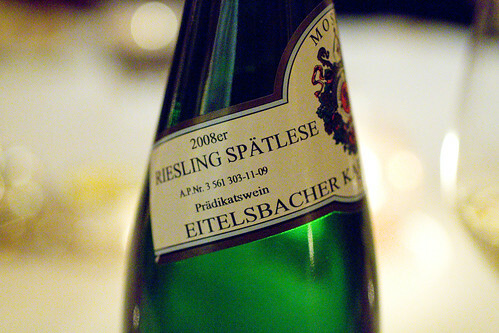 We decided on the Chef’s Tasting Menu ($185 per person) and two bottles of wine to share. 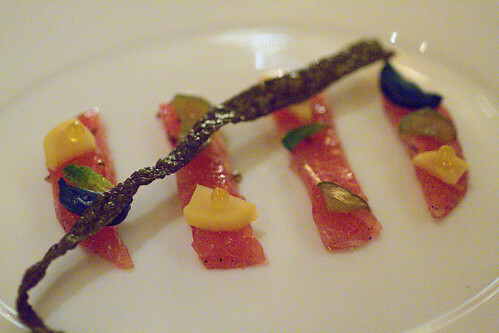 The first course, Smoked Yellowfin Tuna “Proscuitto” arrived soon after. Accented by crisp and salty Japanese pickled vegetables, this was a fun dish to start with: each bite tasted like variations on a theme. One bite saltier, one sweeter, and another with refreshing mint. It was a clever way to get the taste buds going. 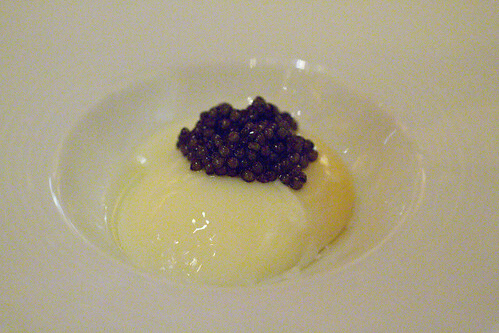 Then, ooh, prized caviar perched like a cherry on top of a perfect poached egg, perhaps the best I’ve ever tasted, and the softest egg whites for sure. As we slowly enjoyed perfection, the gang of us ruminated over what technique was used to create the texture. The mariniere broth and English muffins were perfect accompaniments, making this dish irresistible, even to Lon, who does not usually care for poached eggs or runny yolk. He sopped it all up quite happily. The Langoustine, thankfully left just undercooked in the center, was the centerpiece of a beautiful salad of wild mushrooms and mache, with a white balsamic vinaigrette. Even after being told the seafood was pan seared, we struggled to believe the method could produce such a gorgeous result. Later, during the tour of the kitchen, we were told that the langoustines are started in a cold pan and then heated so “pan-seared” was used loosely. 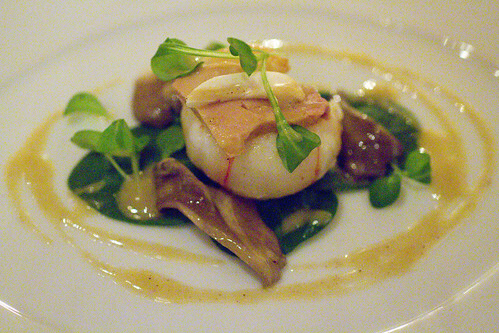 I’m not such a fan of Monkfish, even at La Bernardin. These seafood masters did not overcome the dry, spongy-ness of this bottom-dweller. Anyway, I did not need the fish here, happy with each little Hon Shimeji mushroom, which were naturally buttery, the sake broth, and dabs of turnip-ginger puree. The Black Bass was seared perfectly, fresh, and tender, but it was a tad under-seasoned. It might have been on purpose because of the salty Jamon Iberico and green peppercorn sauce which tied the flavors together, once spooned on top. However, we all found it difficult to spoon up sauce because of how shallow the plate was, which seemed to be a recurring problem. 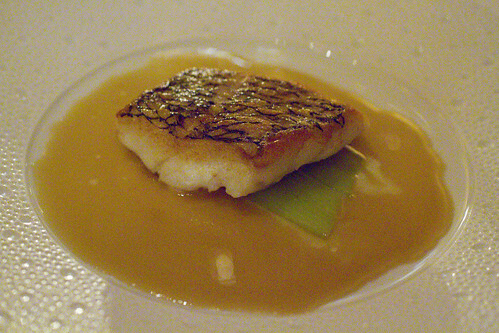 If the Black Bass was good, its accompaniment, the Parsnip Custard, stole the show. 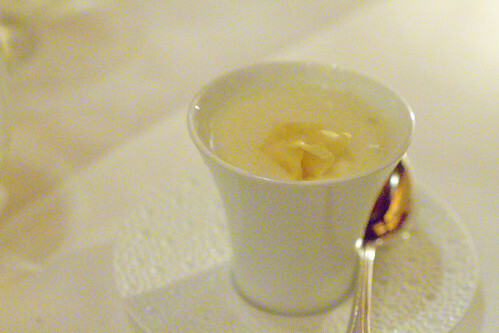 The triple textured dish of custard, foam, and crisp, delivered the best of sweet and earthy parsnips. 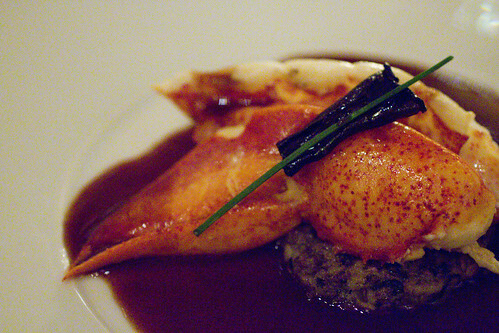 I was intrigued by the Baked Lobster, warm, plump and tender, served with a Brandy Red Wine Sauce. This is a seafood restaurant, so the tasting menu does not end in a red meat course, but this sauce does gives this dish a much richer feel, progressing it to quite a perfect end. 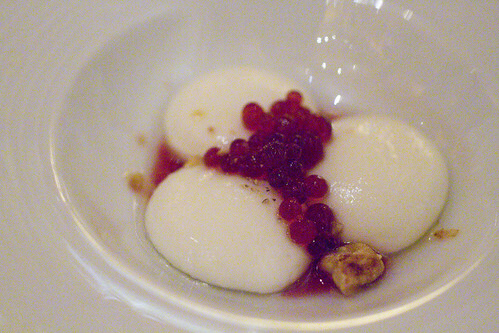 Then, there’s dessert, Goat Cheese Spheres with smaller cranberry spheres and candied walnuts. Cheese, fruit, and nuts is one of my favorite flavor combinations. The spheres seem to be made with a new spherification technique using agar agar (that Sheng informed us of) rather than the (slightly) more common sodium alginate and calcium chloride. The result is a more defined texture surrounding each sphere. I prefer the original technique that makes the membrane less noticeable, like egg yolk. 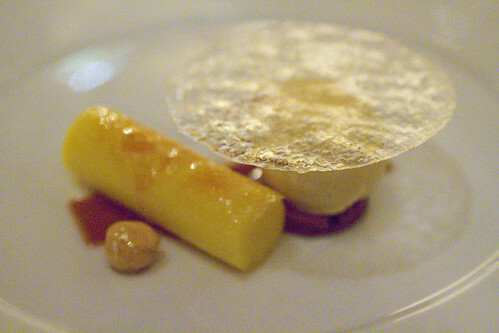 The Caramelized Corn Custard was interesting, as was the popcorn tuile, but most of us preferred the brown butter ice cream and hazelnuts, the traditional pieces of the dessert. A few of us also felt this dessert seemed a bit thrown together, with an uncertain goal. The Mignardises were possibly the best we’ve had, at least the most thoughtful. I hope other restaurants start considering less pieces for better quality. Our favorites were the 1″ cream filled doughnut and the double pate de fruit with a sheet of white chocolate. The rich chocolate cup was also delicious and the pistachio and cherry cake was not bad at all. 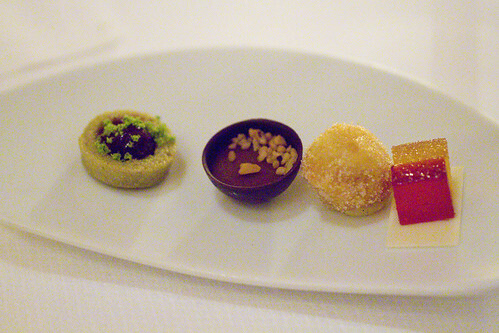 Usually mignardises are mostly forgettable. The meal was quite delicious with many hallmarks. The seafood was always cooked perfectly, though the Monkfish and Sea Bass weren’t all that interesting. However, the atmosphere and service was less formal than expected. For the first half of the meal, we had one server bringing the plates, for the second half, we had two, which made more sense. However, servers were always friendly so no real complaints. It just didn’t have quite as many bells and whistles as say, Daniel, which is roughly the same price. It is still a meal, you should have at least once. posted by jessica	at 01:52 PM	Filed under French, Restaurants, Wine. You can follow any responses to this entry through the RSS 2.0 feed. Both comments and pings are currently closed. Wow what a way to bring in what I am sure will be a great new year for you guys. The food looks really royal. Waiting for the good news on the apartment front. This is THE restaurant I wish to visit in the future. Just the price tag is something I’ve to save up on. What a great start! Love tasting menus, you get to try a little of of everything! Everything looks wonderful. Happy new eyar! Was working on my round up for 5 star makeover and couldn’t help stopping by to read this review! Le Bernadin is of course on top of our list. I’m disappointed to hear about the monkfish in particular. I would think at Le Bernadin it should have been perfect. But I’m glad to hear it was a good meal overall. We’ll be going to Alex in Vegas next weekend. I’m a little worried that it may not quite meet my expectations, but you never know 🙂 Happy New Year! Natasha, looking forward to your review on Alex. Jen @tinyurbankitchen mentioned she might be going as well. I’m surprised how different your entrees look compared to the ones I got at the same chef’s tasting a year ago. Of course, seasons change, but it’s interesting too see what your meal looked like. I also tried the monkfish for lunch a few weeks ago. I loved the flavors, although I agree with you that the texture of the fish could have been more tender. 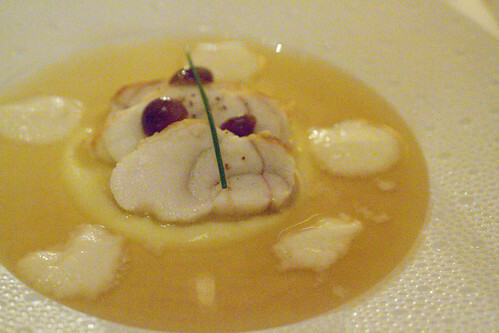 Having said that, I had never tried monkfish before, so I did not know what to expect. In response to your comment above, YES – I will be going to Las Vegas next week! We tried Alex a few years ago. It was very good and the space is incredible, although it was super expensive! Believe it or not, I think NYC is a better value than Las Vegas when it comes to high end dining. All prices just seem higher in Vegas! Anyway, this trip we will be trying a “quick” pre-theater meal at Joel Robuchon, a few celebrity chef restaurants, and Rao’s for Italian. Jen, we have to get together next time your in NY. We’ll grab Steve and Karen too. Looking forward to your posts on Vegas. You had a tour of the kitchen? Fabulous. Loved reading your review. 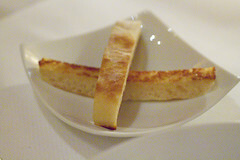 I just posted one of Le Bernardin on my blog. Dolce, haven’t moved yet….it’ll be mid Feb and we’ll be sure to post pics! We’re doing the not-so-fun part of packing now.